We’re home from a few lovely days in Orange Beach, Alabama. Generally cooperative on both car rides, the kids still made “are we there yet?” a constant refrain. D napped a bit but T couldn’t get comfortable. I remember road-tripping with my parents in the ‘80s, when we rode in the back of station wagons and could lay out across the bench of the backseat. I could nap pretty comfortably, and as one lovely older woman recently told me, her parents always said “we’ll get there faster if you sleep.” She and I agreed that maybe it was just a ploy on her parents’ part to get some peace and quiet while trapped in a small space with bickering kids for long hours. My father-in-law and I finally went parasailing. As the only height-loving adventures in the family, we individually longed to go parasailing but never managed to be on the same beach at the same time in cooperative weather and booking conditions. Until this week. While I was expecting a rougher ride, the boat portion of the experience was a bumpier experience than the actual aerial portion. (And the boat ride was just like you’d expect, a few bounces and not rough at all.) Perched high above the water, the boat now toy-sized, the swing harness lazily swayed as we looked down and out to the horizon. Cool breeze on our faces and a solitary peacefulness made me feel like I was on top of the world (certainly more than any Titanic passenger). Dad and I agreed that we could have stayed up there all day. The captain brought us down toward the end of our ride to dip our feet in the ocean before sending us up again and then bringing us back in. We can’t wait to go again. And now that we know that the age limit is 4, it won’t be long until our littlest adventurer, D, joins us too. The kids got to ride on a small Ferris wheel too, a little ~100-footer, for the first time. They were riveted by my description of the Texas Star (from the Texas State Fair), which is roughly twice as high, and the fourfold-taller London Eye, which I enjoyed on a sunny October day back in 2007. Although the ocean was plagued by masses of slimy algae, the sand was powdery white and soft. 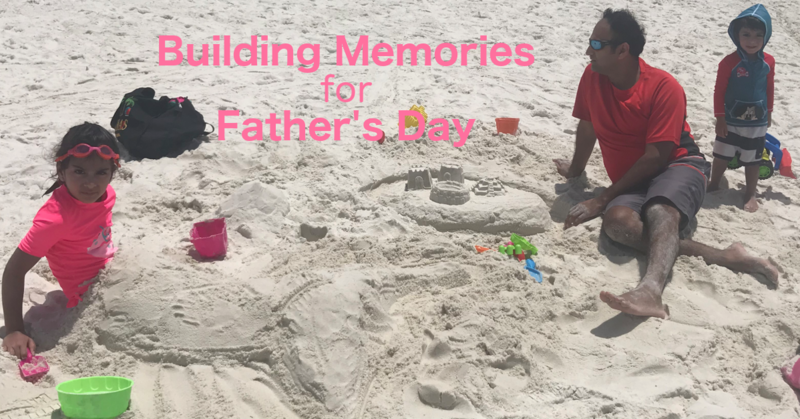 We enjoyed building sandcastles, race tracks, and burying a young wannabe mermaid, who impressed us with her fearlessness in the pool. You can see the fruits of our labors, including her tail and a castle-themed race track, in the picture. Shortly after, our resident demolisher, the “Devinator,” took care of eradicating our carefully constructed infrastructure. Perhaps my favorite part was during our evening walks on the beach. D came with us but wanted nothing to do with actually walking in the cool sand, making the moonlight walk an actual workout for anyone hauling around a ~26-pound munchkin for over an hour. The first day we collected shells, with T and me finding small shells washing up with the waves. The second day, hundreds of stars glittered brightly over the ocean. We came upon some folks searching for ocean critters. They showed us their bucket, which contained a few small fish, a sand flea, and a very unhappily captive little crab. They even demonstrated how the sand flea burrowed in the sand and offered to let us hold the crab or pet the sand flea. Unsurprisingly, K and T didn’t want to touch anything, D was too sleepy, and I would have touched them except that I was on flashlight duty. All told, this trip made some beautiful memories just in time for Father’s Day for my father-in-law and my husband. It’s bittersweet that I won’t get to tell my own father about parasailing or hold his hand walking along a beach. But when I think of his last few months, when I think of a friend who just lost her father to a protracted cancer battle this week, I can’t imagine prolonging his suffering just to selfishly keep him with me a little longer. When my kids woke up yesterday and discovered drink stirrers, they immediately morphed into wizards. Dutifully, I “ribbit, ribbit, ribbit,” from the pillows until he gets bored. “No, turn her into a monster,” T insists. “ROAR!” Replete with a deepened voice, hands gripped like claws, and wide angry eyes, I morph into Monster Mommy. The kids scream, T with surprise and D with some genuine fear. He hides behind his big sister and peeks out at me. After a moment, I offer them an unexpected ROAR again. D screams again and wraps his arms around his sister’s waist. T comforts him with an arm draped over his shoulder. 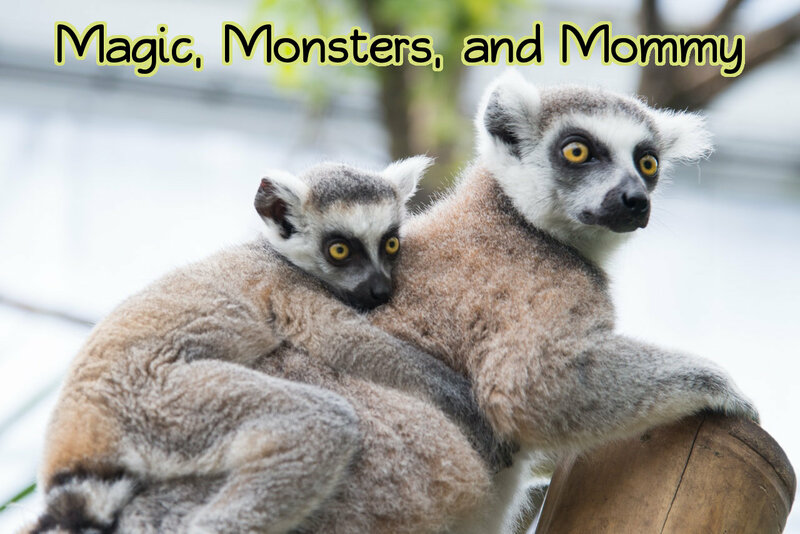 It was a priceless, precious moment I’ll treasure as their mother, even if they did look a bit like these lemurs. “You better turn me into a Mommy again if you want cuddles,” I warn. “No, not yet,” says T, but D is ready. “Sssssss.” He climbs up to snuggle in bed with me while T tries to undo his work. “Your wand doesn’t work anymore,” I tell her. “Only your brother’s does.” And then T climbs up to cuddle with me, too. Best start to the day ever.